Frédéric Mérand, European Defense Policy Beyond the Nation State, Oxford University Press, 2008. Existing literature in international relations (IR) has often used the concept of civilian power to describe the European Union’s (EU) external perception and roles: a civilian power being an entity that does not use military hard power to assert its presence in the international system, but instead uses a complexity of economic, financial, diplomatic, and political means. From the perspective of the return of “power politics” in the international system after the 9/11 terrorist attacks, there was a high demand for a European brand of security and defense making. The Unites States’ shifting of strategic priorities towards the Middle East and its reluctance to shoulder the EU’s security burden gave a further impetus for the creation of a military dimension within the EU. While initially one could state that the EU’s normative, civilian-based identity, was the leading understanding of the EU’s international projection, the emerging global security risks prompted the need to address the EU’ “powerless power”[i] status in new military and security terms. The new international security context exerted increased pressures for the EU to transform from a soft security provider to a hard power and military actor in terms of security and defense capabilities. In the context of an international system dominated once again by militaristic and security-driven agendas and where the hawkish Realpolitik security discourse has taken renewed prominence, the EU found itself at a crossroads. Taking into account the sui generis nature of the EU and its particular ways of its integration project, Frédéric Mérand, in his book project European Defense Policy Beyond the Nation State, addresses and discusses the EU’s supra-national military transformation through the creation of the European Union’s Security and Defense Policy (ESDP) (also known post-Lisbon Treaty as the Common Security and Defense Policy – CSDP). Labelling the ESDP as one of the most ambitious policy projects during peacetime military integration, the author proposes a sociological-inspired research agenda focusing primarily on the EU’s security and defense cooperation and integration at both an actor and institutional level. Taking lead from the conceptual framework put forward by French sociologist Pierre Bourdieu, Mérand advances a political sociology agenda in international relations and develops important conceptual bridges between constructivism and institutionalism in international relations theory. The sociological turn in International Relations and European Studies literatures brings about conceptualisations that offer a more sophisticated analytical purchase in terms of an in-depth scrutiny of both material and ideational dimensions of institutional structures and the role actors play within them[ii]. Frédéric Mérand counts himself among several theoretical path-breakers in the IR literature who have attempted to apply a Bourdieusian approach especially in the realm of security studies. In his book project, Mérand explains the emergence of a transnational security field in the CSDP by advancing a Bourdieusean-inspired theory which is conceptually limited to one of Bourdieu’s key concepts, namely the field. The Bourdieusean theoretical triad of the capital, the habitus, and the field are instrumental for the analytical operationalisation of the logic of practice in a given professional field. Notwithstanding the fact that the afore-mentioned Bourdieusian concepts cannot be easily divorced from their triadic theoretical coherence, the author prefers to unilaterally focus one concept, more specifically the field. The concept of the field[iii] is understood as a “battlefield” with unequal positions, where some actors are dominant while others are dominated, the field becoming the structure of power relations where actors compete over legitimacy and monopoly. The focus on the ESDP and the security and defence field it creates take centre stage in the research: by identifying the “carriers of culture” and the actors with the symbolic power in their respective power/security fields; by pinpointing the interplay between these competing actors and groups over the monopoly of security articulations in EU defense integration; by analysing their symbolic positions within the security field; by looking at the existing hierarchy and its possible toppling; and by identifying the conditions that lead to shifts in the actors values and interests concerning the security and defense problematique. By placing the ESDP in a historical perspective that goes back almost fifty years and is indebted to the European integration project, the author shows how the increased collaboration of diplomatic and military relations in the EU has led to an amplified denationalisation of member states’ defense policies. From this perspective, this unprecedented convergence between diplomats, statesmen and EU bureaucratic elites has created a transnationalised security and defense European field. Mérand empirically demonstrate the high concentration of relations between security and defense policy makers around the ESDP[iv]. While such actors were considered the key high-politics elites, exclusively driving the formation of nation-states, Mérand argues that they have come to shape and have a stake in Brussels’ security agenda. They are searching for an effective answer to their increasing concerns as regards rising international security risks and dwindling national defense budgets. Diplomats and security professionals shifted their political allegiance from the nation state towards the ephemeral “transnational governance” of the EU. The unintended consequences of such transgovernmental security and defense moves in the EU are the denationalisation of member states’ defense policies and conversely the internationalisation of European armed forces through the EU’s new global security agenda. The intentionality of state and EU elites and their actions and also what Frédéric Mérand calls the “carriers of state sovereignty: statesmen, diplomats and military officers”[v] take center stage in the research, as the key institutional and political actors, be them national or international, that compete over the symbolic monopoly of the strategic agenda in the EU security and defence field. According to the author, in order to understand preference formation, the inquiry starts where the action takes place – to grasp the “nature of the game” and the actors’ power positions, the research needs to begin from the analysis of the nature of the EU security and defense field itself. The examination of power structures, security agents’ practices, and their social representation shed further light on security and defense cooperation and integration in the case of the European Union. The author is noting that consensus is being developed in a security field previously considered the exclusive competence of member state and state sovereignty. And one must only look at the unprecedented European policy developments and structures for decision-making in the field of security and defense. The question still remains whether such transgovernmental policy developments in the field of security and defense have the capacity to bring about a convergence in strategic thinking and create a truly Europeanised strategic culture. Frédéric Mérand proposes a form of weak transgovernmentalism in the case of the ESDP and points towards a perception change with member states concerning the advantages of increased integration in strategically-sensitive policy areas such as security and defense. From this perspective, the creation of the ESDP offers the policy outlines for a potential construction of what Deutsch has termed “security communities”[vi], the use of the term pointing at the community’s capacity to constitute an autonomous common military front against an external actor or a group of actors. The security and defense policy in the EU is being both de-territorialised and de-nationalised[vii]. Hence, a conceptual link could be established between de-territorialisation and the ways in which EU governance of a security community might foresee a post-sovereign, an “extra-national” [viii], EU defense policy. All in all, the book is by far an original contribution to the IR literature more generally, as well as to the European Integration academic literature specifically, by offering a careful study of defense cooperation through transgovernmental networks of European security professionals. [i]Mario Telò, (2006) Europe: a Civilian Power? European Union, Global Governance, World Order, Palgrave Macmillan, 63. [ii]G. Lawson and R. Shilliam, (2010) ‘Sociology and international relations: legacies and prospects’, Cambridge Review of International Affairs, 23 (1): 69-86. [iii]P. Bourdieu and L. Wacquant (1992) An Invitation to Reflexive Sociology, Chicago: The University of Chicago Press, 16-18. 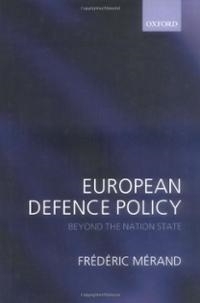 [iv]Frédéric Mérand, (2008) European Defense Policy Beyond the Nation State, Oxford University Press, 13. [v]Frédéric Mérand, (March 2008) ‘The Practice of European Defence: Field, Crisis, and Social Skills’, International Studies Association, San Francisco, 5. [vi]Martin Griffiths, (1999) Fifty Key Thinkers in International Relations, London and New York: Routledge, 288. [vii]Most use of European military power takes place far from national borders and does not involve territorial expansion, occupation or conquest within Europe or in the world. Janne Haaland Matlary, (2006) ‘When Soft Power Turns Hard: Is an EU Strategic Culture Possible?’, Security Dialogue, 35 (1): 105-121, 108. [viii]Michelle Cini and Angela K. Bourne, (eds. ), (2006) Palgrave advances in European Union studies, Palgrave Macmillan, 125. This entry was posted on 18/02/2014 by ISIS Europe in Raluca Csernatoni, Reviews and tagged EU Military Capabilities, EU Security and Defence Integration, European Union Security and Defence Policy, Transgovernmental Security.